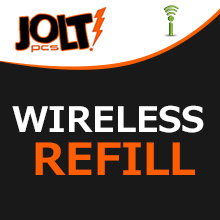 Jolt PCS prepaid offers monthly plan pricing with a variety of popular bundle plans. All plans include FREE! Nights & Weekends along with the latest multimedia features synonymous with post-paid providers. Web Access: Unlimited on plans with the web feature. Downloading and Uploading deducts 1 min of airtime per 8kb. Domestic Long distance and Roaming are included. International calling is available (See provider for more details). Walkie Talkie Plans also include: Voicemail/ Caller ID/ 3-Way Calling/ and Call Waiting. Night & Weekends*: 9PM to 7AM Monday-Friday and all day Sat & Sun. You must have 1 anytime minute left to use N/W minutes. 10 cash and 20 cash denominations: 15 cents per minute (incoming and outgoing calls) and per text message (incoming and outgoing texts). Has 60 cents daily access fee (whether used or not) for Unlimited nights and weekends. Cash balance rolls over after every card refill. To load a PIN, dial 1-877-777-9014 and follow the voice prompts. - For technical assistance, please call 1-888-699-8736.